Located in the heart of Loudoun County, Virginia, and serving Loudoun County, Leesburg, Arlington County, Fairfax County, and the entire metro area, Floors & Kitchen is your kitchen remodeling and new floor supercenter. Floors & Kitchen is happy to announce the opening of a new showroom in Manassas to serve the Prince William County region. Hundreds of options are available, from ceramic tile, granite countertops, hardwood flooring and new carpeting. 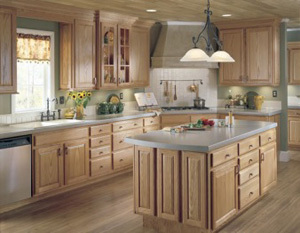 Along with a great selection of new custom cabinets we also offer low-price cabinet refacing and refinishing. We carry over 500 styles and 1,000s of colors. 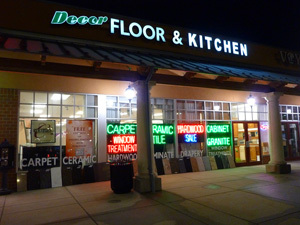 We are your new carpet discount store located just off the Cascades Parkway and Route 7 (Harry Byrd Highway) in Sterling, VA. Our on-site resource center is always available for you! Carrying a vast array of architect folders, deck boards, sample racks and product displays you have access to everything needed to get you started on your dream home project. We carry top name brand carpets including Mohawk, Mowhawk Silk, Aladdin, Shaw, Philadelphia, Queen, DuPont Stainmaster, Weardated, Sutton, or Cabin Craft. We have Commercial carpet as well as residential flooring available in some of the most popular styles including: Berber, textured, plush, Frieze, tactesse, and Saxony. 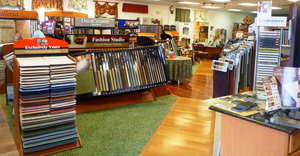 We also carry a large supply of area rugs and remnants. 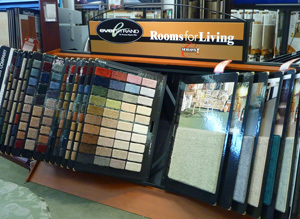 Floors & Kitchen is your Metro Area and Northern Virginia Mohawk carpet distributor. Did you know that Mohawk carpeting comes with 60-day satisfaction warranties? After installation if you decide you don’t like the way the color matches your new wall paint or your puppy decides to sharpen his teeth on the new addition up to 60 days after installation of a Mohawk carpet, give us a call, we’ll gladly come replace it* with a replacement (and chew spot free) carpet that finishes your room perfectly. 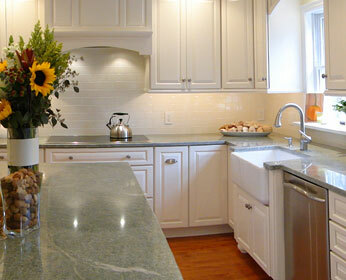 Ceramic Tile is a great way to add value and beauty to your home. From floor tile mosaics, backsplashes, tile fireplace surrounds, and even bathroom wall or floor tiling, we have what you need. 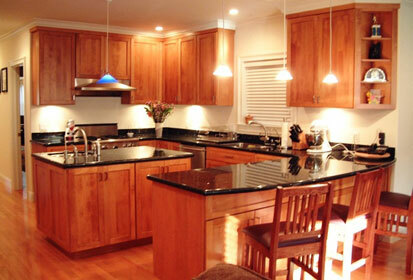 Wet Bars, Sinks, Cabinets, backsplashes, countertops. Just ask! Would you like a free estimate? Answers are just a phone call away. Call 703 444 5595 or send us an Email. 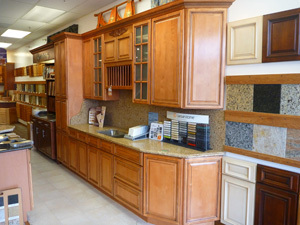 Come visit our complete kitchen showroom. 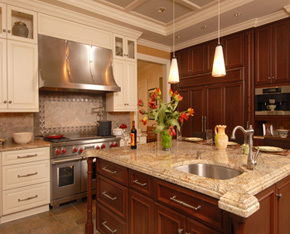 Get some ideas for your personalized kitchen using our kitchen cabinet design center. Need help with ideas for a one-of-a-kind theme or design? Our professional customer services representatives are here to help. If you live in or around the Loudoun County areas of Ashburn, Sterling, Brambleton, Herndon, Leesburg, Lansdowne, Reston, South Riding, and Chantilly or anywhere off of the Dulles Greenway, you are within minutes of our store. Please give us a call when you are ready for your personalized kitchen, flooring, bathroom, countertops, and carpeting, or to find that new tile design, hardwood flooring design, new backsplash, custom carpeting, carpet re-stretching, custom granite fireplace, tile fireplace surrounds, granite countertops, cheap deals on carpet, discount flooring, or customized cabinetry. Floors & Kitchen Inc is a professional flooring company that specializes in kitchen remodeling and bathroom remodeling, in Loudoun County. 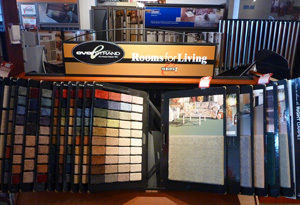 We also carry quality carpet, hardwood floors, ceramic tile, granite counters, laminate, and cork. We also service Fairfax County, Arlington County, Washington DC and the entire metro area in including Sterling, Ashburn, Sterling, Dulles, and more.